Now doing many kinds of performances and producing works fabric art, calligraphy, watercolors, and so on. Began to study jazz in the Kyoto University, Dark Blue New Sounds Orchetra. (Played Duke Ellington's music). 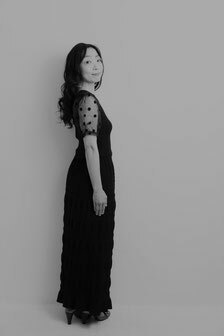 The first vocal teacher is Yoshie Ichikawa, and have learned the spirit of jazz and blues from her. In 2007, joined workshop by Barry Harris, Richard Davis, Lewis Nash at Hagi, Yamaguchi Prefecture. Majored in Pedagogy in graduate school of faculty of education in Kyoto University, and history of culture in graduate school of letters in Osaka University. Started the career as a professional vocalist since 2011. In 2011, 2012, joined Summer Program at Vermont Jazz Center. In 2013, stayed for 3 month in Madison, WI, U.S.A., and studied with bassitst, Dr. Richard Davis. 29th, Oct, 2016, released 1st album " The Rainbow-Colored Boat", with Yosuke Kurita, Keijin Shu, Akira Hasegawa, Ohmichi Yuda, Hiroshi" Gori" Matsuda from Vermilion Field.